I’ve come to realize I am an aspiring meal prepper. “Aspiring” being the key word. I love the idea of having all that healthy food at the ready, but the truth is, I kind of hate doing the actual “prep” part of the equation. Not even kind-of, to be quite honest. Yes, it’s glorious to start out the week with a fridge brimming with gloriously healthy meals in perfect glass containers. But to be honest, in my opinion, getting to that point is such a chore! I’ve spent entire Sundays meal-prepping for the week and wondered afterwards where half my weekend went. Sunday evening, I flop on the sofa in a heap, feeling like I’ve just prepared a Thanksgiving meal. No one wants to feel like they’ve prepared a Thanksgiving meal every single weekend! Well, at least not me. A sneaky, much easier way to prep for me is to make a meal bigger than I need, then save the rest in the fridge or freezer. Another, less fancy word for this, I suppose, is “leftovers.” Leftovers are the best! Also, I just like to make the meals I do make easy. 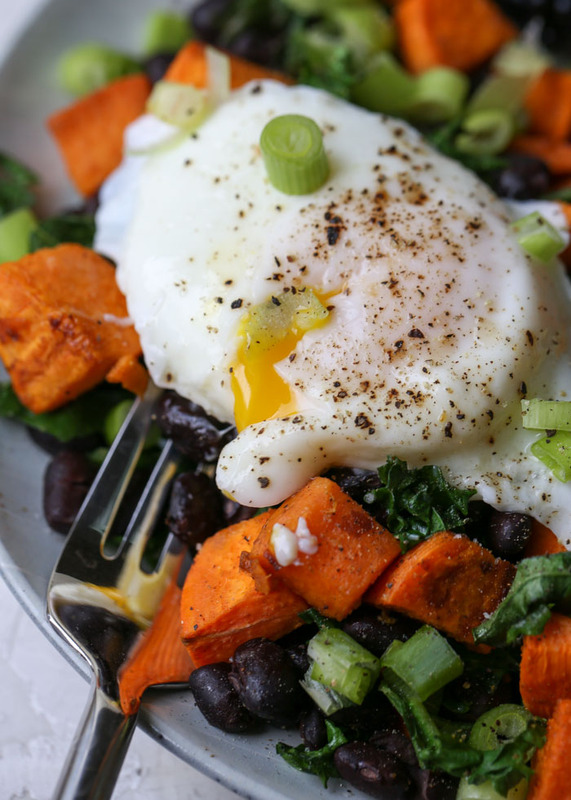 This hearty, savory Sheet Pan Black Bean, Sweet Potato, & Kale Breakfast Hash works perfectly on both fronts. It cooks up one sheet pan and also – if I’m the only one partaking – gives me three mornings’ worth of breakfasts. The first, hot out of the oven, and the next two days worth in the form of leftovers. No lost Sundays, just 30 minutes or so one morning – most of it hands off. Win! I’ve found that for me, the most satisfying breakfasts with the most staying power involve lots of protein and fiber. Lentils or beans are perfect for that. 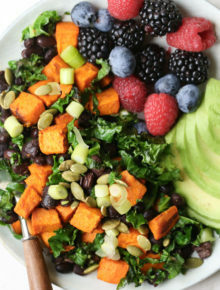 Sweet potatoes – tossed in a few spices then roasted – lend a nice dose of carbs and vitamins. Lastly, some kale. Because kale! 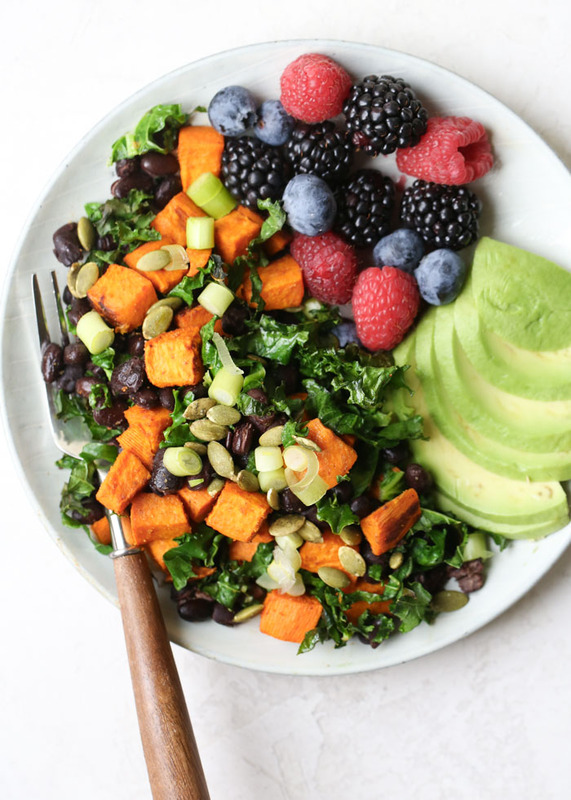 I kind of feel like some avocado on the side is mandatory, not only because it adds some nice healthy fat to the equation, but also because it’s delicious. I also like a smattering of scallions, maybe some salted pepitas, and – if I really want a rib-sticking situation (vegans, avert your eyes) – perhaps a poached egg on top. Preheat oven to 400 degrees Fahrenheit and pull out a large rimmed sheet pan. 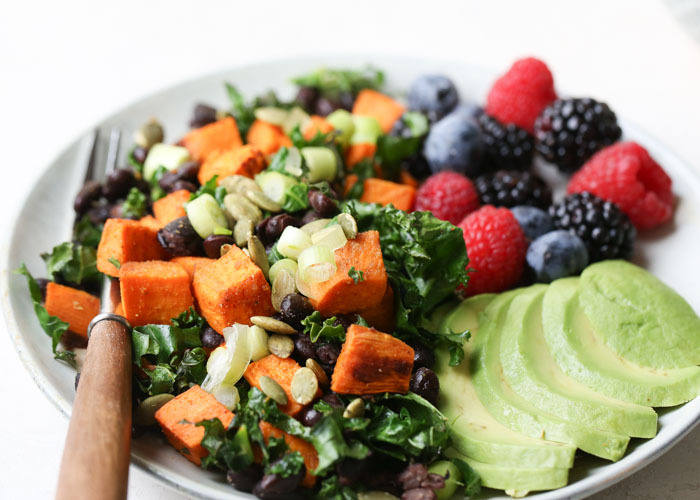 Place the cubed sweet potato on the sheet pan and drizzle the olive oil over the top. Sprinkle the onion powder, garlic powder, cumin, smoked paprika, and 1/2 teaspoon salt over the top. Toss with a wooden spoon or (easier) your hands to distribute the oil and spices. 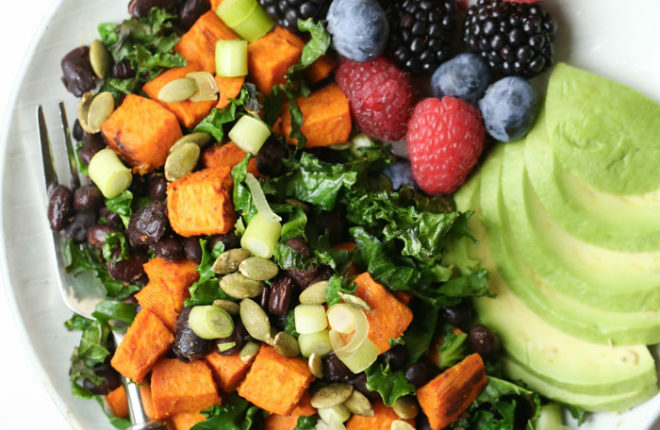 Try to give each piece of sweet potato as much space as possible. Bake until tender and beginning to brown, 15-20 minutes, tossing once halfway through. 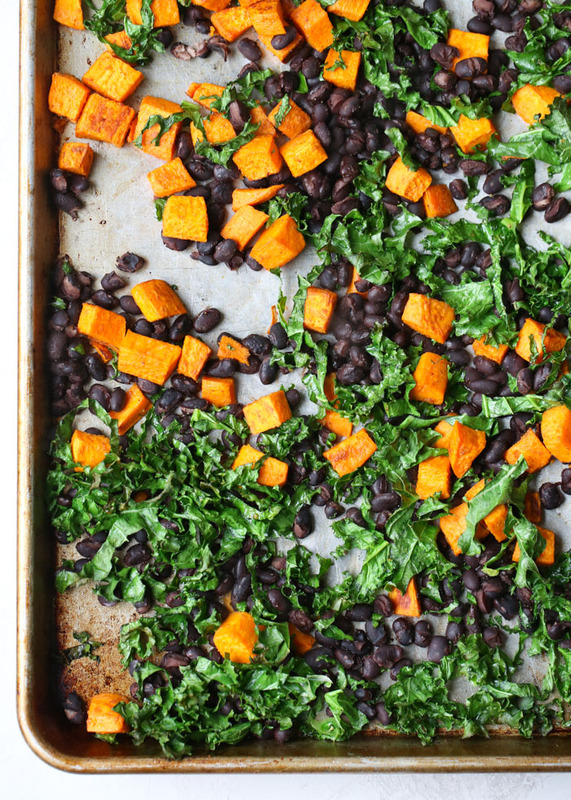 Remove from oven and add the beans and kale to the pan. Toss with a wooden spoon to mix everything together. Place in oven for another 5 minutes until the beans are warmed through and the kale has wilted. Remove from oven. Taste and add additional salt and pepper if desired. Serve with avocado, salsa, and/or a poached egg if desired.